Little known but enchanting, the sparsely populated Laos offers a chance to get immersed in authentic natural and cultural settings. Wandering around the quirky capital of Vientiane, enjoying the romantic ambiance of the royal town LuangPrabang with its splendidly decorated temples and traveling through lush tropical forests promise an incredible adventure experience you can not find anywhere else. An incredible and fulfilling journey to Laos, land of diversity! Arrival at LuangPrabang airport, where you will meet your guide who will bring you to your hotel.Overnight in LuangPrabang. 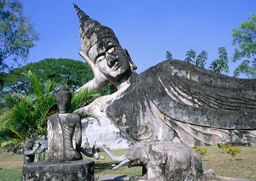 LuangPraband is a World Heritage site recognized by UNESCO as the best-preserved city in South East Asia. 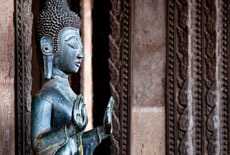 Start exploring this charming town with its impressive WatVisoun, WatAham, Wat Mai and WatXiengthong temples. You then climb to the top of Mount Phousi to discover its sacred, gilded stupa as well as enjoy the panoramic view of the city and the sunset over the Mekong. 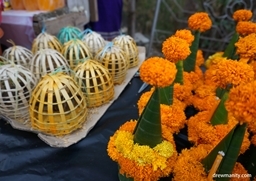 Return to LuangPrabang to visit the night market where lovely handicraft items are sold. Overnight in Luang Prabang. In the morning embark a boat to cruise upstream on the Mekong, a scenic journey with breathtaking views of the tranquil countryside. 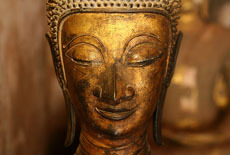 Discover the mysterious Pak Ou Caves, two caves linked to one another filled with thousands of gold lacquered Buddha statues of various shapes and sizes donated by pilgrims. 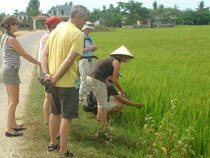 Along the way, you will stop at Ban Xanghai village, where local rice wine is produced. On return, you take a short drive to Ban Phanom, a small village known for its amazing woven handicrafts. Overnight in LuangPrabang. 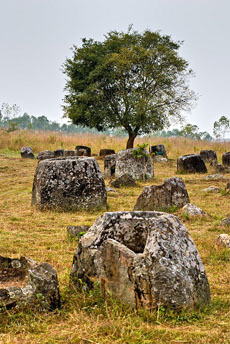 The “Plain of Jars” is an impressive archaeological site where hundreds of large stone jars are scattered over a plateau. These huge jars are supposedly over 2,000 years old, but their purpose is still a mystery to archaeologists. You will explore the site and some nearby villages of Hmong and Tai Dam hill tribes before heading to VangVieng, a small tranquil town nestled on a river bend of Nam Song River. It sits amidst a stunning scenery, a mixture of quiet atmosphere and limestone outcrops. Overnight in VangVieng. Start walking around the bustling central market before taking a bamboo raft along Nam Song River with its limestone cliffs and valleys. VangVieng is home to numerous caves. the most famous of which is Tham Chang, which servedas defense against Chinese invaders in the early 19th century. 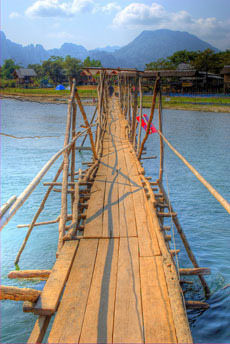 You will cross the river to reach Ban HuaiNgai, a little village typical of Laotian rural life. In the afternoon, you will leave VangVieng and head toVientiane, the capital of Laos located on the banks of the Mekong River with its fusion of Lao, Thai, Chinese, Vietnamese and French culture. Overnight in Vientiane. Full day spent visiting Vientiane's highlights beginning with WatSisaket temple, the oldest temple in Vientiane. Continue the tour at the former royal temple of Haw PhaKaew, which previously housed the sacred Emerald Buddha statue, the Prabang. Then you head to the imposing Patouxai Monument known as Vientiane’s own Arc de Triumph and the splendid That Luang Stupa, national symbol of Laos. 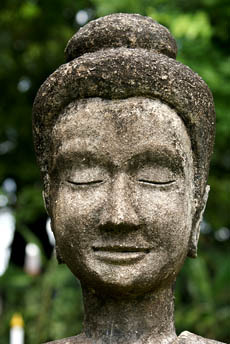 You then drive out of town to see the Buddha Park, a fantastic collection of Buddhist and Hindu religious sculptures scattered around a Mekong meadow, near the Friendship Bridge. Enjoy a spectacular view over the Mekong River. Overnight in Vientiane.. Morning flight to Pakse. You will be welcomed by our guide and then transferred to Tadlo. On our way we pass many lush plantations, hills and rain forests. We stop over at some of the nearby villages, home of the Kato hilltribal groups who still retain their old traditions. We continue our journey through the Paksong and Boloven plateaus. The Boloven plateau is known for its cooler temperature as it is located high above the sea level. Rivers run off from this plateau in all directions and then plunge out to the rain forests along in a series of spectacular surging waterfalls. The scenery around Tad Fan waterfall is spectacular with the twin waterfalls plummeting into a deep gorge surrounded by flourishing vegetation. A trip gives you great chance to observe the cultivation of rich coffee, tea, cardamom, bananas as well as to venture off the beaten track and discover some of the untouched areas of Laos, exploring the wild beauty of this southern region. Overnight in Tadlo. You will leave Tadlo and head to Pakse. 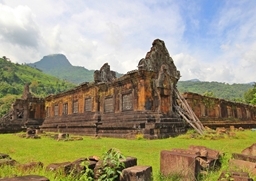 Enjoy a boat trip to the former royal capital of Champasak, where you willexplore the ruins of WatPhu, one of Southeast Asia's most dramatic temples. 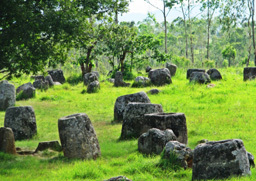 Youalso have time to discover the intriguing Khmer ruins perched on Mount Phu Kao. WatPhu, a World Heritages Site recognized by UNESCO, is a fantastic archeological site of Khmer civilization dating back to the 9th century, much older than the legendary Angkor Wat in Cambodia. A festival is held here annually during the full moon in February and attracts numerous pilgrims from all over southern Laos. You continue your journey by motor boat to Don Khone, the largest island in the South Mekong River region known as the 4000 Islands region, one of the most scenic areas in Laos. Overnight on Don Khone Island. After breakfast, you are free until being taken to the airport for departure flight. Asiatica Travel’s services end here. 2 - 3 - 4 stars accommodation based on 2 persons/room as mentioned in the program. Other services that are not clearly mentioned in the "price includes" list. The Tadlo impressive waterfall is 85km from Pakse, on the way to Saravane. Many ethnic villages are scattered around the waterfalls, as well as several lodges and resorts where you can arrange for an elephant ride to the surrounding forests and villages. 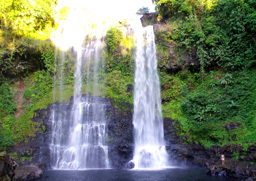 The Tadlo area is renowned for its tranquility, freshness and beauty of the three waterfalls (Tad Hang, Tad Lo, Tad Sung). 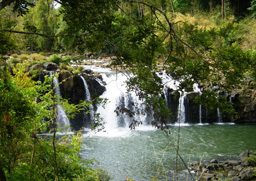 The Bolaven Plateau is the third largest city, about 50 kilometers to the east of Pakse. This region consists of three provinces: Salavan, sekong and Champassak. 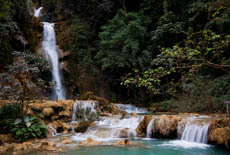 Having cool climate and fertile soil, Bolaven is considered the largest coffee growing region of Laos. 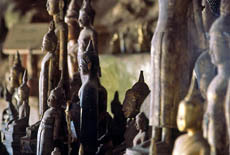 The Champassak province is one of the greatest cultural, political and economic centers of southern Laos. It was also a center of administration for the French, hence some of the distinctively beautiful French architecture you will see up the main street. 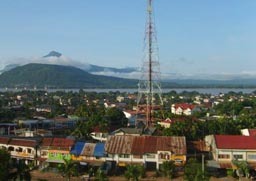 Pakse is a city in Champassak province in southern Laos. 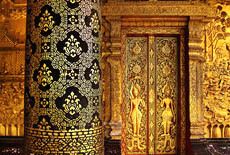 Being on the outskirts of Thailand, Cambodia and Vietnam gives it the advantages in term of economy. 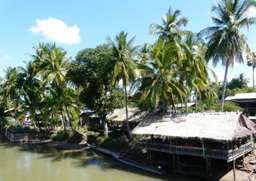 Boat trip to visit Pak Ou Caves - handicraft villages of Ban Xanghai& Ban Phanom .